Dieses Longboard in klassischem Look bringt dir Mega-Auftrieb und surft sich super einfach mit viel Style! Egal, ob Beginner oder erfahrener Surfer, es bringt dir jede Menge Spaß und wird dich nicht enttäuschen. HOG THE WAVES ON A LOG! More is better when it comes to having fun and the LOG delivers! In true Odysea® form, the LOG has a classic look and feel with mega-float performance so you can shred with ease and style. So whether you're a stoked grom learning to surf or a seasoned vet looking to maximize wave count, the Odysea LOG is for you! The LOG is a legit board designed by real surfers in California. Enjoy. Super-Fun for all skill levels! Tons of Float and Easy Wave Catching. Stiff Dual Composite Core. Triple Wood Stingers! Durable HDPE Slick Bottom with Bumper-Tail. Old-School PE Deck with Throwback Design. Soft-Performance Tri-Fin Set with Leash Plug. 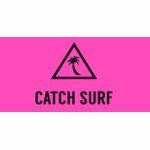 Designed by Catch Surf in California, U.S.A.